Intoxicated individuals tend to focus on more immediate situational cues than future consequences. The report "Alcohol and Violence"
Violence is one of the great scourges of humanity and alcohol fuels much of it. This statement opens a new publication that presents updated knowledge on the relationship between the use of alcohol and violence. The authors argue that levels of violence in a society can be substantially reduced through changes in alcohol policy. Anecdotal evidence from many cultures around the world show that there is a link between alcohol consumption and the prevalence of violent behavior, be it physical, psychological or sexual violence. However, there are still discussions over how strong this link is and what the mechanisms could be. Such issues are discussed in a new publication from three Swedish institutions; IOGT-NTO, the Swedish Society of Medicine and CERA, a research and education institution under the University of Gothenburg. The authors, experts from Sweden, the US, Canada and Australia, argue that there is a causal relationship between alcohol and violence. The report “Alcohol and violence” can be downloaded from IOGT-NTO’s web site. 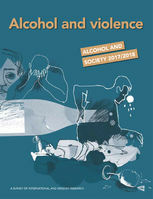 The starting point of the publication is that alcohol use contributes to violence affecting people across the whole life-course and in many situations, including: violence between family members, intimate partners, friends, acquaintances and strangers, child maltreatment, youth violence, sexual violence and elder abuse. The authors argue that alcohol impairment can increase the probability that there will be a violent response to inter-personal conflict, frustration or a perceived threat, concludes the report. Furthermore, people are more likely to be victims of aggression when they are intoxicated. The evidence for a causal relationship between alcohol and violence was studied by triangulating the findings from different research approaches. This led to the conclusions that human and animal experimental studies suggest that the pharmacological effects of alcohol cause changes in thinking, emotions, and physiology that increase the likelihood of aggressive behaviour (e.g., feeling overconfident, becoming angry with relatively minor provocation) and violence victimization (e.g., not recognizing unsafe situations, being less able to defend against, of flee from, attack). Biomedical evidence also suggests that alcohol counteracts the inhibitory functions of the brain which suppress aggressive impulses. It is also said that there is evidence that learned beliefs about alcohol and aggressive behavior (e.g., the belief that when ones drinks it is ‘normal’ to be more aggressive) can shape violent behaviour after alcohol consumption, although the pharmacological or physiological effects of alcohol on the brain are more powerful determinants. The authors conclude that while many causes of violence are difficult to change, alcohol as a cause of violence stands out as being highly amenable to change through changes in alcohol policies.